College lecturers across Scotland are today taking their fourth day of strike action as part of a long-running pay dispute. Lecturer members of the EIS Further Education Lecturers’ Association (EIS-FELA) are campaigning for a fair cost of living increase, in line with current public sector pay policy. Lecturers have not had a cost of living pay rise since April 2016. However, the employers’ association, Colleges Scotland, has offered what amounts to a consolidated uplift of only 2% over a three-year period for the majority of our members, while also seeking to tear-up existing commitments on lecturers’ working conditions. In an escalation of the dispute, EIS-FELA is also in the midst of a statutory ballot on industrial action short of strike. Should members vote in favour of the action, the escalating action will include a boycott of college results systems and a withdrawal of goodwill. This action would run concurrently with the ongoing programme of strike action. Last week, delegates at the EIS-FELA Annual General Meeting unanimously backed a Vote of No Confidence in the management body, Colleges Scotland, following its failure to negotiate in good faith towards a fair pay settlement. EIS-FELA President Pam Currie said: “College Scotland’s offer falls far short of public sector pay policy, and now they have suggested that we sacrifice terms and conditions in order to make a deal. We do not want to take strike action, boycott results or withdraw our goodwill. We work in Further Education because we care about our students and want them to have the best possible college experience. 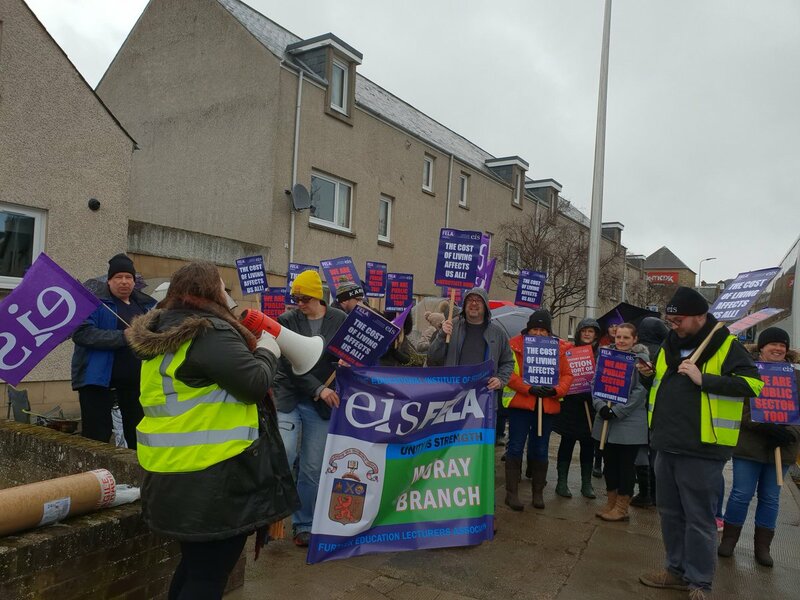 EIS general secretary Larry Flanagan said: “EIS-FELA members have stood strong and united throughout this strike while Colleges Scotland has shown it is unwilling to engage in meaningful negotiations. It is especially disappointing that Colleges Scotland failed to accept the EIS offer to suspend strike action earlier this month and again this week.